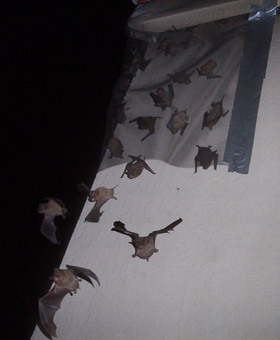 Bat Control in Florida: This is what we specialize in - the safe and humane removal of colonies of bats from buildings. Bats, by nature, seek out dark crevices to roost in during the day, before they emerge at night to forage for insects. However, certain species of bats form what are called maternity colonies: these are large groups of female bats that live together and bear and raise their young in a group. A maternity colony needs a large area to roost in, and preferably a hot one. These bats love to live in buildings, usually up in the warm attic or roof space. The problem with a large colony of bats is that they will not go away. Once bats find a suitable roost, the colony will stay generation after generation, hundreds of years if the structure remains intact. The colony size only grows over time. Bats live a long time, usually over ten years in the wild, and each year as the females give birth, the colony size grows. Not only do the bats make noise and swarm all about (which many people find unsettling), but they create quite a strong odor problem. The most serious issue is that they leave behind their droppings and urine. With a large group of bats, the droppings can really pile up - hundreds of gallons worth - over time. This not only creates an odor problem, but a health hazard. The droppings can corrode wood or metal over time, and they can grow fungus that can cause lung diseases for people. It's best to have bats removed. A swarm of bats at a Tampa FL hotel. A bat I removed from Jacksonville. A colony of bats in Naples, FL. Bat Control at a Miami, FL church. Miami Bat Control: The Miami area has many bats. Many of the buildings have Spanish style barrel tile roofs, and bats love to live under these tiles. I once got a group of bats out of a huge hotel in Miami, in which the bats were entering through thousands of small gaps in the tile. I've also worked in Fort Lauderdale, Boca Raton, and Boynton Beach. Tampa Bat Control: The Tampa Bay area is full of bats. We have done several large projects in Tampa, Clearwater, and Saint Petersburg. One of the largest jobs I've ever done was for a huge nine-building condominium complex in St. Petersburg. The location near the coast may mean that there's extra insects, or perhaps it's just a matter of the architecture in this area, but it's loaded with bats. Jacksonville Bat Control: I've done a lot of professional exclusions in Jacksonville, FL. One of the first jobs I ever had in that area was a shopping center - grocery store and such - that had bats entering the entire back wall of the building - over 500 feet worth. I removed them all, and cleaned out the droppings inside the building, which covered the drop-ceilings. I've also done work in Saint Augustine, Palm Coast, and Daytona Beach. I've even removed bats in Titusville on the east coast. Naples and Sarasota Bat Control: The coast along the Gulf of Mexico has many bats. One of the first very large bat projects that I ever did in the state of Florida was for a shopping mall in Sarasota. It had a barrel tile roof, and thousands of bats. I safely removed them all, cleaned up the mess, and to this day, over five years later, the building remains bat-free. I recently got bats out of a 10-story condo in Naples. That was a very difficult job, and I had to use a 100' bucket lift. 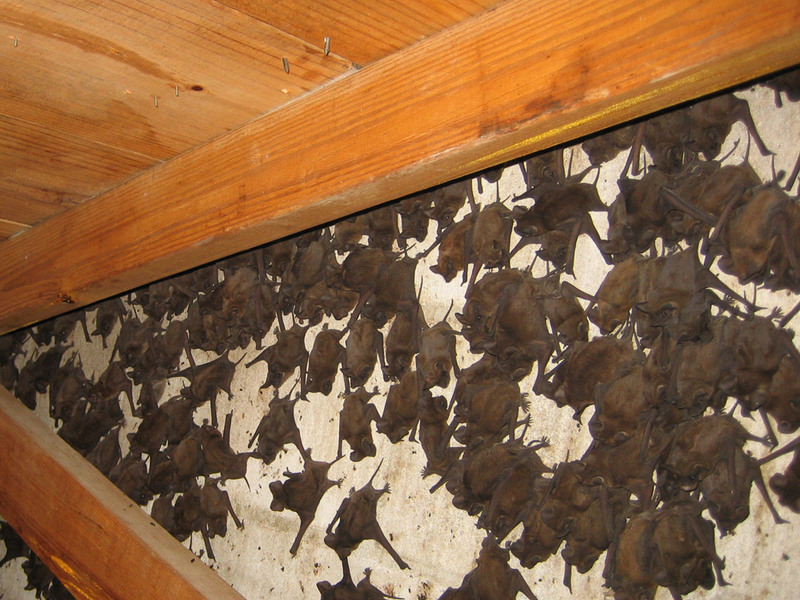 I've removed bats in Port Charlotte, as well as Fort Myers, Cape Coral, and Bonita Springs. West Palm Bat Control: I service the entire east coast of Florida. The West Palm Beach area has many bat problems. I once got over 2000 bats out of a hotel in Melbourne. They were four stories high. I've also worked in Fort Pierce and Port Saint Lucie. I also of course do Orlando and Kissimmee bat control. Click here to learn more about the species of bats in Florida. 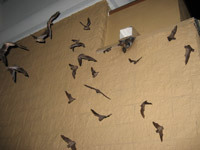 Click here for an example of removal of bats from buildings job. 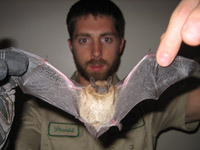 24/7 Wildlife is a professional wildlife and get rid of bats company located in Orlando, FL. We provide Orlando bat removal and bat control for the entire state of Florida. 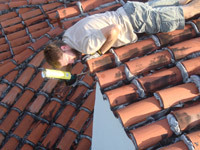 We are the leading experts in Florida at solving conflicts between people and wild animals, and we specialize in bats and the removal of bats in the attic. We do not kill problem bats, nor do we use bat traps, or bat repellent, none of which are legal nor work. We are fully licensed and insured, and dedicated to the highest quality of work. 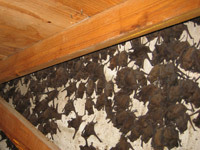 We guarantee all of our services, and not only do we get rid of bats in the attic or your home or business, but we make sure to repair any damage that they cause, clean up the biohazardous waste that they leave behind, and seal all entry points so that no bats can ever enter your house again. If you need Florida Bat Control or bat pest control anywhere in the state of Florida, give us a call any time for more info.